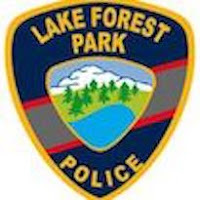 Lake Forest Park police warned residents around 11am on Tuesday, April 10, 2018, that they were involved with a burglary in progress call at 190th and Ballinger Way NE. The K9 unit was there and they asked people to stay away while officers worked the area. The suspect they were searching for was described as a white male 5’10 wearing a blue top and blue jeans with brown hair. Shoreline Police came to assist. The search area was about a third of a mile from Lake Forest Park Elementary but the school was not put into lockout. Just before noon, an alert citizen saw the subject going into a shed and called it in. Officers quickly converged on the scene and arrested the suspect.